Pink Pineapple Is An All Girls Surf Camp That Is Here To Empower Girls Through Surfing. We Want To Have A Place Where Girls Can Learn To Surf Together And Experience The Pure Stoke That Comes From Riding A Wave While Being Introduced To The Greatest Lifestyle In The World. We Are Soul Surfers Who Surf For The Pure Love Of It, Living Life In The Moment Making Memories That Will Last A Lifetime. We Want Girls To Feel Inspired And Empowered To Live The Life Of Their Dreams One Wave At A Time. Because After All, Girls Just Wanna Have Fun! Welcome To Pink Pineapple Surf! Run By Girls For The Girls! Pink Pineapple believes in the power of girls. We are an all girl surf camp run by girls for the girls. We offer a 3 hour surf camp, private lessons and birthday parties. PINEAPPLE MY RIDE!! 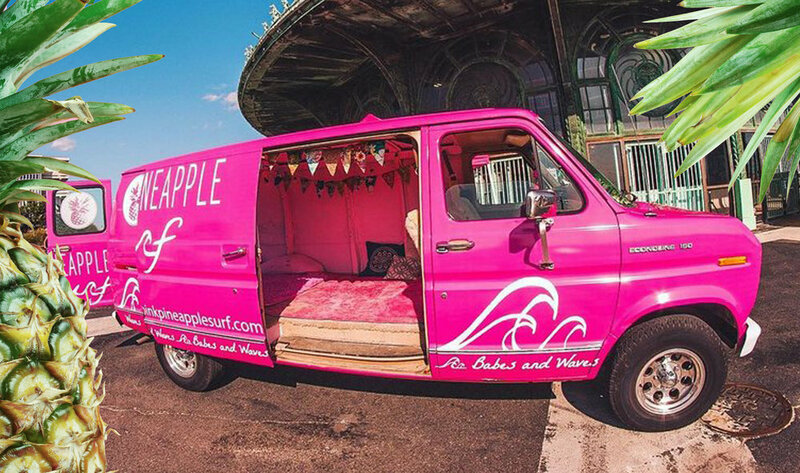 A story about how we bought a 1989 Ford Econoline and transformed it into a Pink Pineapple Babe!!! Meet Pink Pineapple Mascot Daisy!! Daisy loves surfing more then anything in the world. She is a true mermaid at heart!! FOLLOW US ON INSTAGRAM @PINKPINEAPPLESURF !! !